The Green Room motorsport hospitality is one of our most extraordinary packages that oozes grandeur. In Monaco, from onboard our luxury yacht, take prime position in one of the world’s most expensive marinas. You will enjoy the ultimate Formula One VIP hospitality in the company of A-List celebrities and the world’s social elite while sipping champagne and rubbing shoulders with some of the globe’s sporting superstars. Can Lewis Hamilton achieve his 6th win at Silverstone in 2019? Watch the action live in one of our VIP hospitality facilities. Enjoy the most glamorous event in the sporting calendar alongside an array of famous faces - we have previously been joined in The Green Room by Jamie Dornan and Ronan Keating, as well as a selection of motor sporting legends. 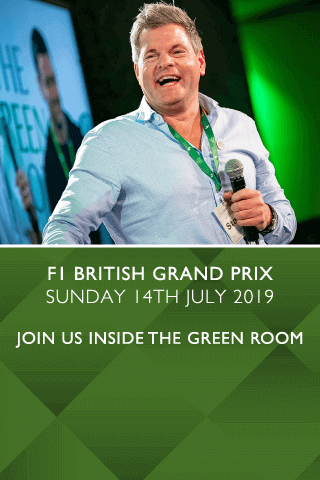 We have also introduced the highly-prized Green Room Silverstone hospitality experience in time for the 2019 British Grand Prix, which offers panoramic views of the track and a motorsport hospitality experience never seen before on home soil. Whether you choose to visit in Monaco or Silverstone, we are confident that the amalgamation of Formula One with The Green Room experience is sure to be like no other. Our team provides the highest levels of service to all hospitality guests and we take every effort to ensure that your experience is one that you’ll never forget. Will you be attending for business or pleasure? With our motorsport Green Room events, it doesn’t matter. Our Green Room packages are suitable for every guest, as we cater for business parties to wow boards of directors and to enrich business relationships with our corporate hospitality packages. Even if you’re attending for business, there’s no doubt you’ll take pleasure in this extraordinary event. Those attending with friends and loved ones can indulge in the finest cuisine, whilst enjoying the fast-paced action of traditional British motorsport. Spot the stars whilst you sip your complimentary beverage and take in the sweeping views. You and your guests will feel like movie stars as you take part in this spectacular event. As experts in providing hospitality packages for a whole host of sporting and non-sporting events, we know how to produce experiences that create lasting memories. Our exclusive packages are based on creating the best day possible for motorsport fans - and The Green Room is a sure way of achieving this. You’ll be able to soak up the atmosphere of an exciting Formula One event (plus the Monaco sun, if that’s where you choose to go!) and the buzz of an A-List party, making it the ultimate experience for any devout fan. We are proud to have achieved a 5-star rating on Trust Pilot and that our visitors return year after year. The Green Room motorsport is well-known and highly regarded in the sporting world, which makes it popular with some of the world’s leading sporting legends - and next, it could be you. Hospitality Finder prides itself on providing affordable, exceptional hospitality events that make every guest feel treasured. Football fans can cheer at Liverpool hospitality events, with Arsenal hospitality tickets, or at your preferred team’s location. If you’re more of a rugby fan, we provide Wales rugby hospitality and England VIP rugby tickets for our guests. If you’re interested in sharing a day with us, view our diverse range of sporting events on offer and find your perfect event. Want to know how you can be there? Submit an enquiry and discuss your needs with us today. Alternatively, view our other events including The Green Room at Cricket or Rugby hospitality at The Green Room.